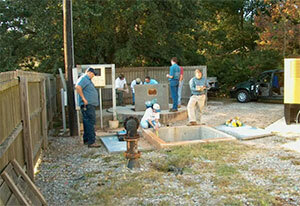 As a subconsultant, McFadden Engineering participated in the development of a capacity management, operations, and management (CMOM) program development for the Mobile Area Water and Sewer System. McFadden Engineering assisted with evaluating more than 200 lift stations in the system, including the determination of pump curves and the evaluation of pump performance. In addition, McFadden Engineering assisted the client in the development of a critical spare parts list for the lift stations, performed a lift station standard specification review, and helped with the development of a pump standardization program. McFadden Engineering also assisted with the evaluation of Halls Mill Creek and Eslava creek Pump Station force mains, which included reviewing existing force main “Record Drawings” and developing an overall profile to make a preliminary determination of areas of potential risk. In addition, McFadden performed visual inspections of the force main where it was above ground to assess outer wall and air release valve conditions. In conjunction with the CMOM program development, McFadden Engineering also performed numerous tasks related to an odor and corrosion evaluation of specific pump stations in the system. These tasks included collecting product information for various odor and corrosion control options, contacting vendors to perform pilot studies at selected lift stations, accompany vendors on site visits to stations, collecting and evaluating pertinent data for determination of product performance, and developing cost estimates for implementation of odor and corrosion control equipment. McFadden Engineering also assisted with the development of a GIS system for MAWSS. Project tasks included the collection of sub-meter locations for all interceptor and non-interceptor manholes, as directed by prime consultant, contained in the sanitary sewer collection system. In addition, rim elevations, invert elevations, invert pipe sizes, discharge force main sizes, manhole diameter, manhole depth and other miscellaneous features were collected.